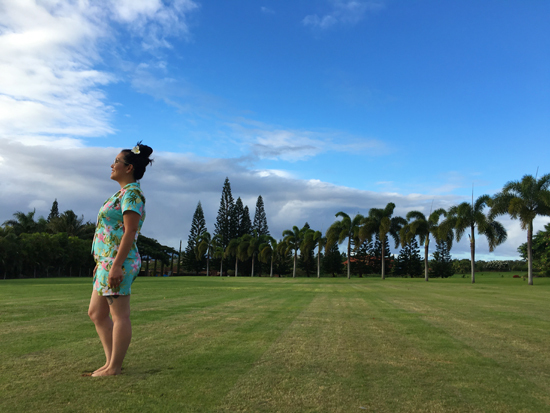 Once upon a time I had a blog and I actually updated it! Life was freaking crazy lol. It's been a while since my last post, so I decided to shock people and actually update this thing! I even remembered my password! 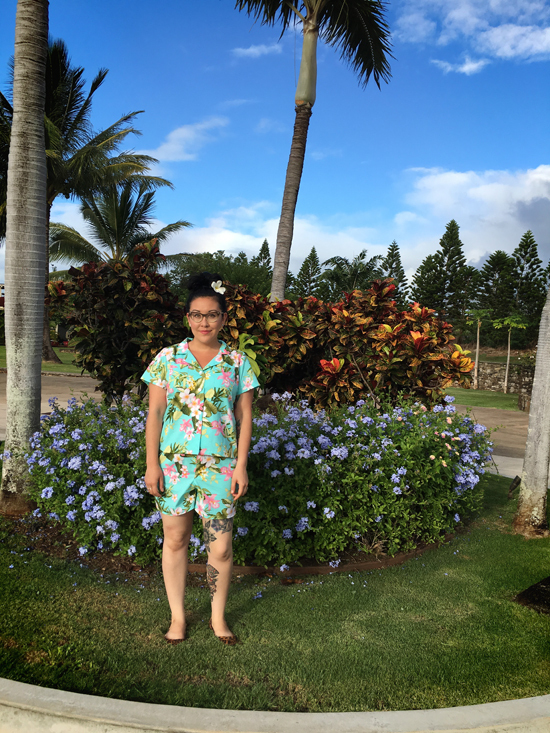 I went to Maui recently with my family and of course I had to make some Hawaiian themed clothes (yeah, I was THAT tourist) and I want to share them with you guys over the next couple of posts. The scenery there is stunning, but you prob saw that if you follow me on Instagram, and I took full advantage of the natural backdrop. First off, my fabric choices were completely inspired by Tom Selleck of Magnum PI fame. He was my mom's number one celebrity crush until she discovered Chris Isaak, so I am very familiar with ol' Tommy. 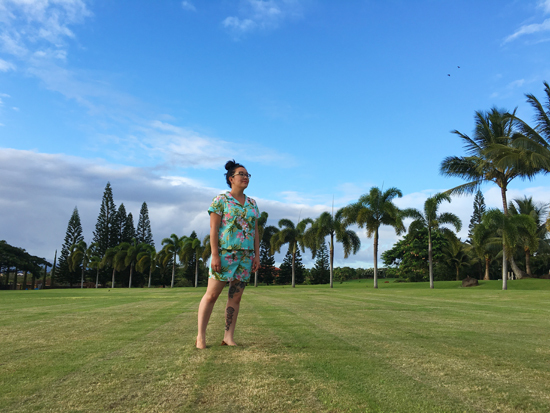 This Hawaiian quilting cotton was purchased online from Hawaii Fabric Mart. At the time there was a five yard minimum order for their fabrics, so I bought five yards at $4.99 each, but now the website is saying they can do one yard cuts for some of their stuff. Not much to say about it, but it's pretty nice fabric and was a good choice for the patterns I paired it with. And I'm actually stoked that I ordered five yards because the print is beautiful and I want to make something for my niece if I ever decide to stop being selfish with my time. 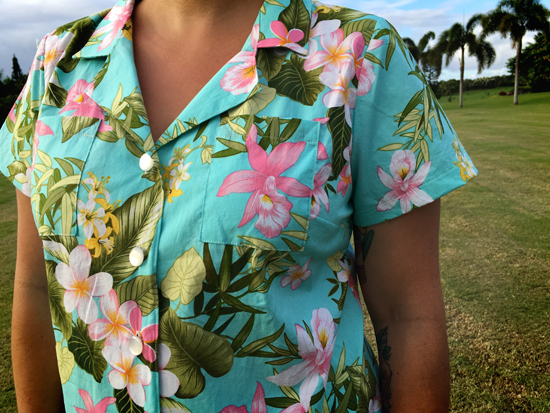 Let's talk about the SBCC Paloma Blouse. Actually, why aren't you guys talking about it?!?! It's a great pattern from a great company. 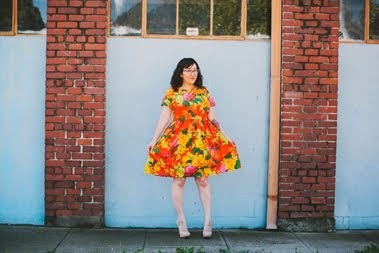 It is geared toward petites, and I now realize that I fall into that category, so I rarely have to make any adjustments to the patterns, which makes me happy! This shirt was sewn without any major changes (other than spacing the buttons a little wider apart) and I am really really happy with the fit. 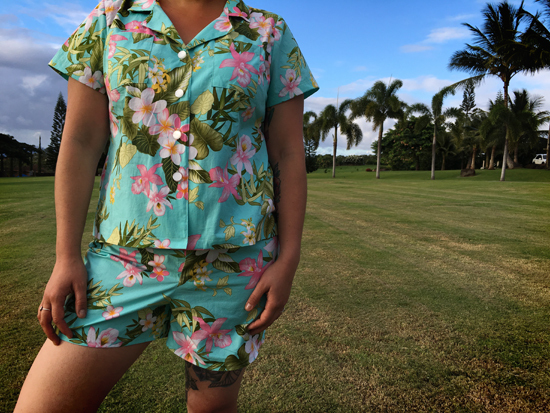 The style is awesome and will be perfect for showcasing some of the quilting cottons I have stashed away and will also look good with silk or rayon, two of my newfound loves. Well, View B (the view I made) will be great for the quilting cottons and View A will be good for the other fabrics. My only complaint, and I feel so petty and dumb for saying this, is that I wish that the instructions told you which seam allowance to use while sewing. It's listed at the beginning, but I like being reminded during the actual step because there is a 76% chance that I will forget and sew the wrong one. 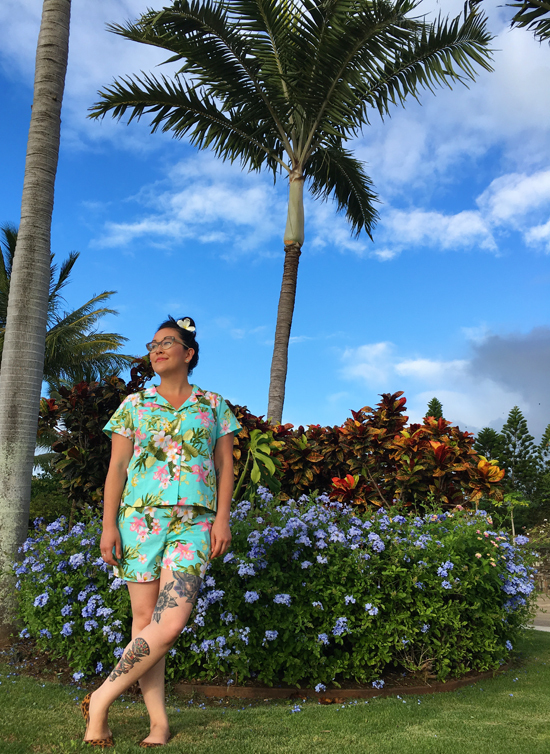 The shorts are the Seamwork Weston pattern, a high waisted retro style short. I didn't make a muslin for it and didn't make any changes, but I feel like I ended up with a decent wearable muslin! Yeah, I for sure need to adjust the fit for my next pair, but I am still stoked on these. I prefer a higher rise to a lower one, so once I make some changes this is going to be my dream pattern for summer. 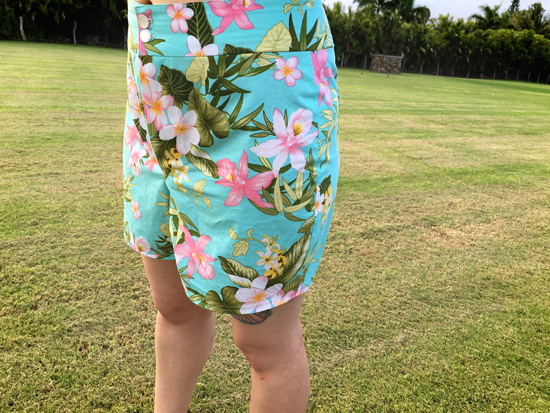 Of course, I sewed these at the end of summer, so the next pair will have to be my Future Summer Dream Shorts of 2017. The actual sewing of it went well, however, I did get confused when it came to doing the fly front. I've only sewn one a couple of times and I needed more help than the directions provided. I think I referenced the directions for the Ginger Jeans since that is the only pattern I have successfully done a fly front for. I have to include this photo because I look so awkward and it cracks me up! Any Tom Selleck fans out there? Mahalo.